On The Brakes, And At The Double – But Still Accelerating! 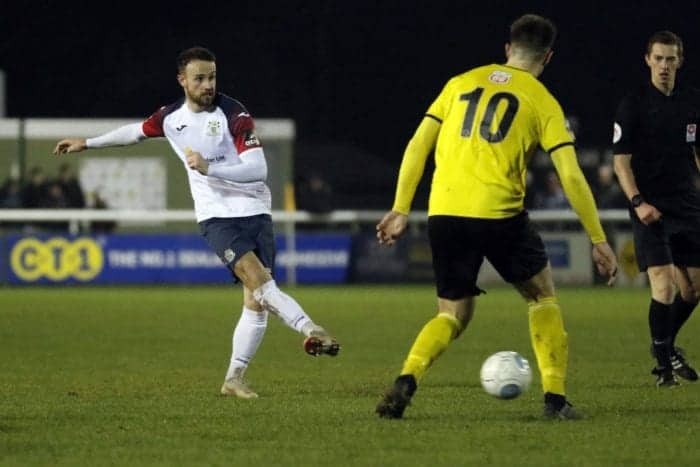 The Hatters ground out a single-goal victory at a near-freezing New Windmill Ground to achieve a ‘double’ over the ‘Brakes’ of Leamington, as well as a sixth successive league win that put them within four points of table-topping Chorley. 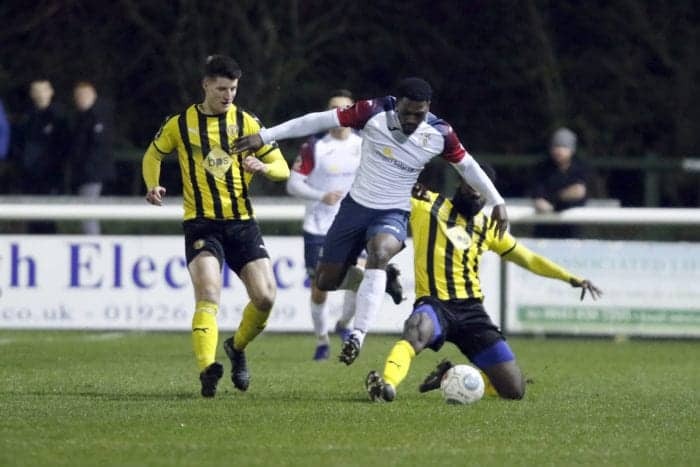 The game’s pivotal moment came eight minutes before half-time, when Darren Stephenson converted. And, for those in attendance, it was a veritable collectors’ item as the winger scored with his head for the first time in a County shirt. Jim Gannon named an unchanged 16-player squad from that against York City at Edgeley Park three days previously. And the starting 11 again took to the field in a 4-2-3-1 formation – with Ash Palmer continuing to act as captain in the short-term absence of the injured Paul Turnbull. 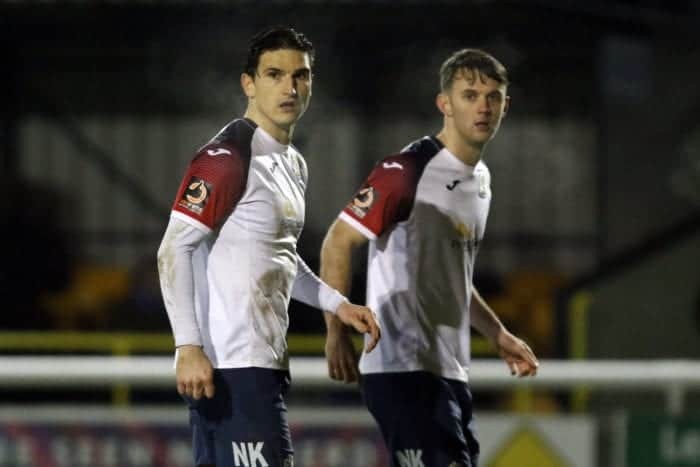 In the course of a lively opening 10 minutes, County enjoyed the greater share of possession – earning three corners for good measure – although the one true attempt on goal was courtesy of the hosts, for whom Junior English cut in from the right before firing straight at Ben Hinchliffe. But the Hatters soon began to create opportunities of their own. From Sam Walker’s cross on the left, Adam Thomas, when only just inside the box, glanced a header wide of the far upright. And Frank Mulhern also nodded shy of the right post, after connecting with Jordan Keane’s delivery. Matty Warburton, with seven goals to his name from the last two matches, went closer still after the half-hour mark – hitting a first-time shot from the edge of the area that home goalkeeper and skipper Tony Breeden did well to tip around the right post at full stretch. Then, with 37 minutes on the clock, County struck what was to prove the decisive blow. Good work by Thomas on the right led to a cross for Warburton, whose deflected shot looped towards the far post where Stephenson was waiting to head home for his fourth goal of the campaign. The Brakes could, and arguably should, have equalised three minutes ahead of the break, but central defender Jamie Hood dragged his shot wide of the left post following a corner. HALF-TIME: Leamington 0, County 1 (Stephenson, 37). The Hatters began the second half in similar attacking mode to that which they had displayed for the majority of the first. Mulhern blasted over following an initial, post-interval attack, before seeing another shot defected past the left post – and Palmer headed shy of the opposite upright from the consequential corner. Stephenson, brimming with confidence, had already worn out the Brakes on the left before half-time – and continued to do so, turning English inside-out before crossing to Mulhern who back-heeled just wide of the far post. Mulhern then turned provider, with a sublime through-ball to Thomas that the latter drilled narrowly beyond the left upright. And Keane, from the edge of the box, volleyed into the arms of Breeden, before skying a subsequent attempt out of the ground and then, from much closer range, getting a final touch that drifted just wide of the near post from Thomas’ corner on the left. The hosts had cause to be thankful to their long-serving ‘keeper again with 18 minutes left, when Breeden executed a fine double-save to deny County’s two Sams – tipping away a deflected, looping cross from the right by Minihan, before parrying Walker’s snap-shot on the rebound. 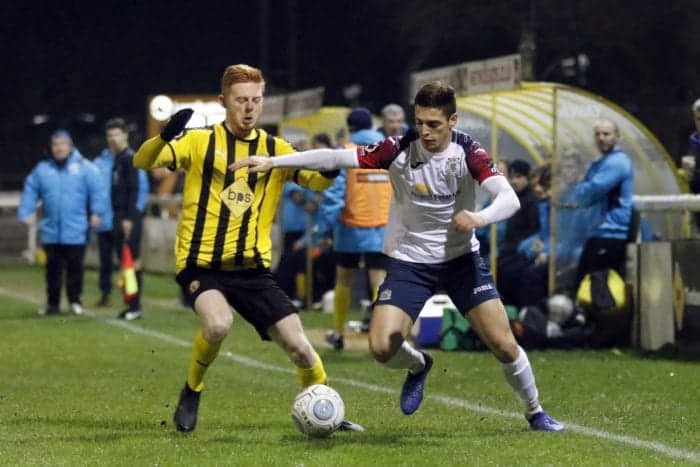 Having dominated for much of the first 75 minutes, County needed to be resolute in defence during the final 15, as Leamington livened up with the introduction of substitutes who included on-loan debutant midfielder Sam Wilding from West Bromwich Albion. Wilding himself and Ahmed Obeng both had shots blocked, and leading scorer Colby Bishop headed over from a corner. 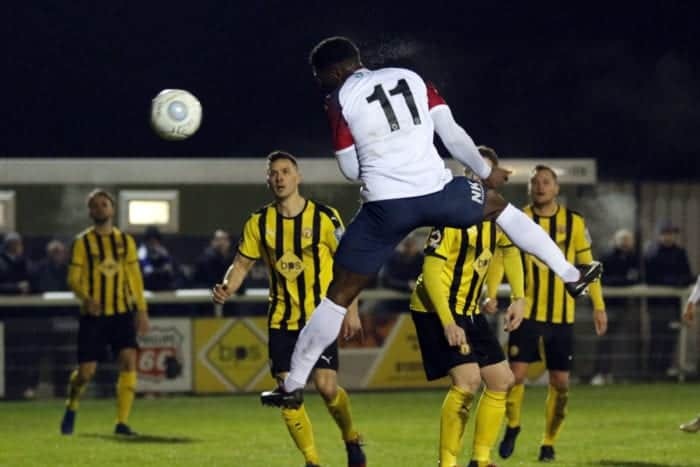 But the Hatters successfully kept an eighth clean sheet in 10 competitive matches – and, moreover, secured with it another valuable three-point haul. They also came close to signing off for the evening with a second goal, only to see Scott Duxbury’s shot from 15 yards pushed behind by Breeden in the dying seconds. FULL-TIME: Leamington 0, County 1 (Stephenson, 37). Team: Hinchliffe, Minihan, Duxbury, Keane, Palmer (Capt. ), Stott, Thomas (Osborne, 82), Walker, Mulhern, Warburton (Cowan, 78), Stephenson (Kirby, 85).